In this article, we'll show you how to display data from your Instagram account on your Geckoboard dashboard. Which metrics and visualizations are available for Instagram? Display the number of likes for recent posts as a bar chart. Display follower and like counts for media or a user. Search for Instagram using the Search sources field. Alternatively, you can also scroll down the alphabetical list of integrations until you reach the Instagram integration. Click on the Instagram integration. Is this is your first Instagram widget? 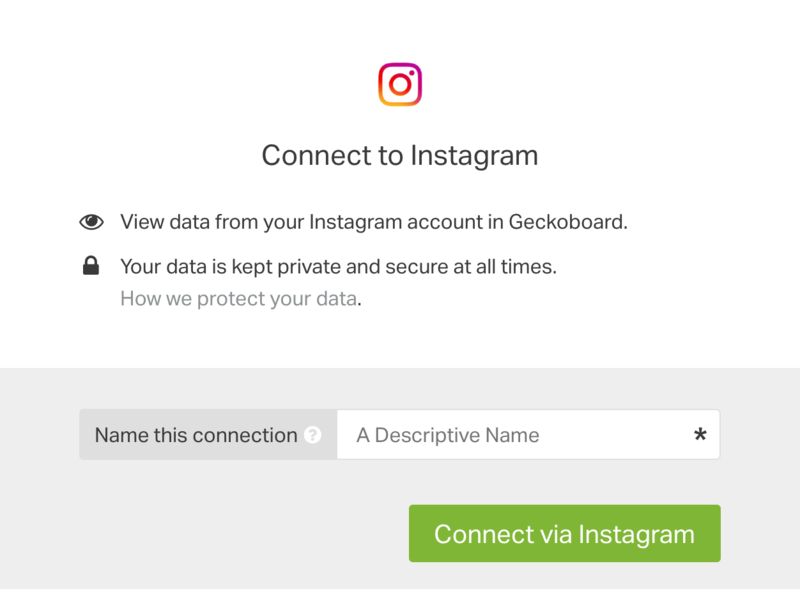 You'll need to connect your Instagram account to Geckoboard. If not, you can skip to our example Instagram widgets. When adding your first Instagram widget, you'll be asked to create a connection and authenticate your Instagram account so that we're able to collect your data and display it on the dashboard. You only need to create this connection once – we'll take care of the rest. Click on the Connect via Instagram button. 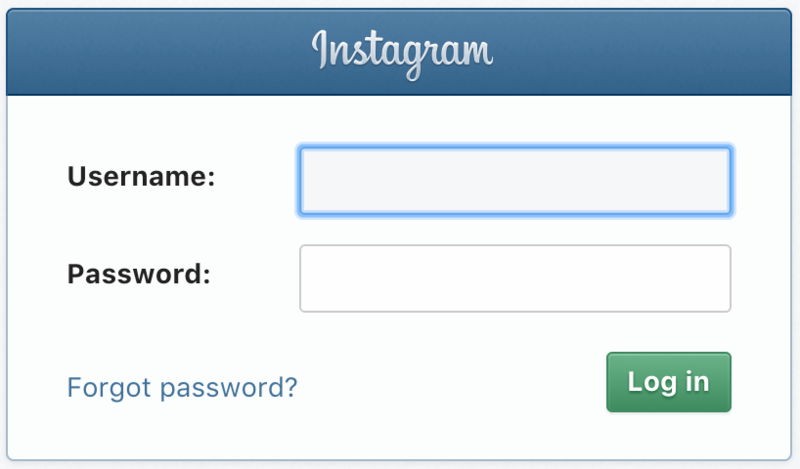 Inside the pop-up window, enter your Instagram Username and Password. You're now ready to configure your first Instagram widget! Any Instagram widgets you create will pull in and display data from this Instagram account. You can connect as many Instagram accounts as you need, but you'll only need to authenticate once per account. 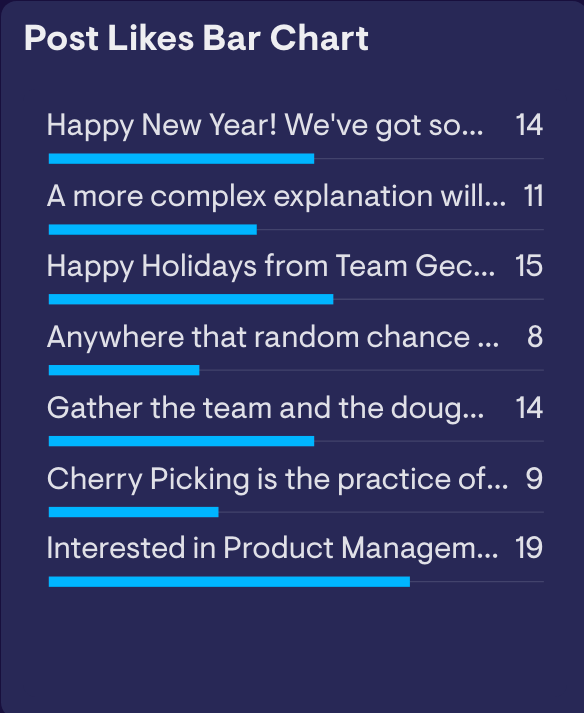 The Post Likes Bar Chart widget displays the number of likes for recent posts. We can use the Post Likes Bar Chart widget to show the most popular Instagram photos from the last 10 recently posted. 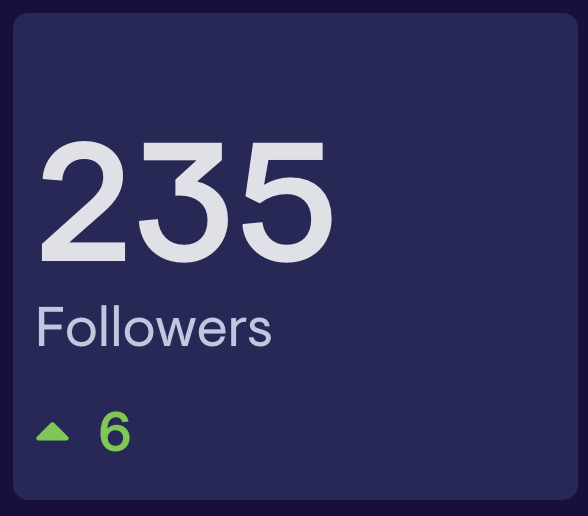 The Instagram Stats widget displays follower and like counts, with an optional secondary stat. We can use the Instagram Stats widget to show the total number of Instagram followers for an account.